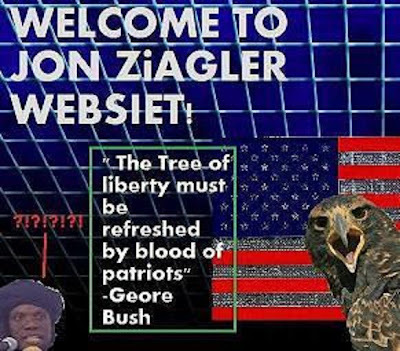 John Ziegler is an important guy. While I posted a few days ago about his upcoming cinematic event, Media Malpractice, yesterday JJ noticed that he’s scheduled to speak at CPAC along with an unannounced guest*. Being interviewed at CPAC is serious business given that past speakers have included Presidents and Senators, and this year’s lineup is no disappointment: Joe the Plumber and Hans von Spakovsky also get some time in the spotlight. 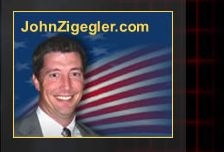 Knowing all that, the state of Ziegler's website seems even sadder. Remember this picture? Using my guru-like mastery of the principles of graphic design and the five elemental magics I conjured that up as an offering. Note my careful implementation of an attractive coloring scheme and the use of fundamental spacing skills to draw the eye from area to area. Then I accidentally converted it from jpeg to bmp a dozen times, resulting in ugly jpeg artifacts and washed-out colors, but I’m sure he won’t mind. It’s a masterpiece! The rest is up to you. Create tasteful works of conservative art that could adorn his website for years to come. Email them to me or to the Train of Thought email address (should be on the top right of the page) by midnight Sunday (East Coast time). I’ll post them all on Monday, and if we have some real winners I’ll even email them to Ziegler and offer help for any future endeavors** he might have in the works. Good luck to all! *Gosh I wonder who that might be, you betcha. ** Someone has to create a movie poster for Media Malpractice- it may as well be us! Not sure on an image yet. Joe the plumber is tempting, but I might have to go the Bristol Palin and Levi Johnston route. I've put together a cartoon that clearly shows Obama, Biden, and Pelosi are much more deserving of the public perception that has been unfairly attached to Palin. Go to http://www.hootervillegazette.com and scroll down to the bottom of the page. Then copy it and send it to every conservative you know. Ask them to display it at work on their desk, at home on the fridge, and anywhere else people might see it.